Would you do Ironman Blindfolded? You are here: Home / Sport / Triathlon / Would you do Ironman Blindfolded? Attempting to complete any IRONMAN event is a daunting task but doing so with any form of impairment should be commended. 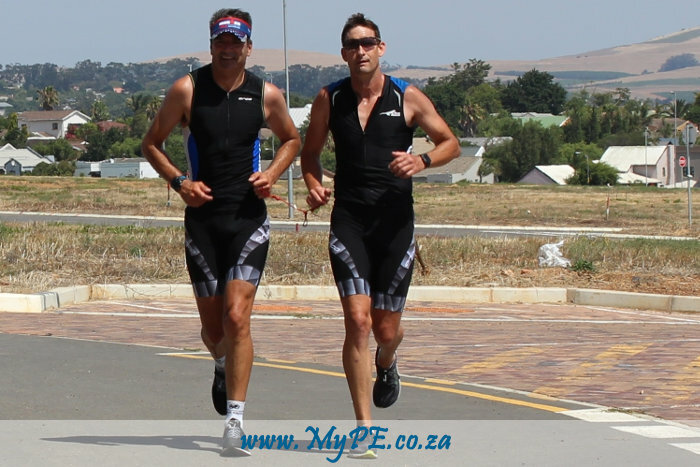 David Jones, a 40-year-old computer programmer from Cape Town, will be entering the Standard Bank IRONMAN 70.3 South Africa in Buffalo City on 27 January 2019 as a visually impaired athlete – aiming to complete his first IRONMAN 70.3 event. As a guide, Cornel Botha will be entering alongside Jones in the race. Jones was born with Retinitis Pigmentosa (RP), a hereditary condition that causes degeneration of the retina. The rate of degeneration depends on the person, and although Jones was legally blind from a young age, he was fortunate enough to have usable vision into his early 30’s. Initially a loss of peripheral vision is experienced, eventually leading to the loss of central vision. Jones and his guide athlete, Cornel Botha, initially met to participate in sporting events but have since become best mates. Jones and Botha try to train together as much as possible. The duo swims together in the Canal at the V&A Waterfront, cycle together on weekends and run outside. This is separate from their individual training throughout the week. “Training for three disciplines can be quite intense and demanding, sometimes requiring two training sessions a day and longer training sessions over the weekends. It requires much discipline but the 70.3 is the prize and keeps me motivated,” mentions Jones. While the 2019 Standard Bank IRONMAN 70.3 Buffalo City will be Jones’ first IRONMAN event, Botha has participated in a couple of IRONMAN 70.3’s and also a couple of full IRONMAN events. Botha says “it is an honour to compete alongside a legend like David Jones,” who shows that hard work and perseverance pays off. Such an encouraging story for all showing us that nothing is impossible, just keep moving forward.